Minneapolis-based Graves Hospitality released its first rendering to the public Tuesday morning for its soon-to-be flagship hotel at the Minneapolis-St. Paul International Airport. The full Metropolitan Airports Commission gave the hotel developer and management firm its unanimous approval Monday afternoon. Graves is proposing a 9-story, 300-unit full-service hotel with a luxury spa, restaurant, observation deck bar and lounge and a parking ramp below. The developer will have to receive Federal Aviation Administration's approval for its height design. 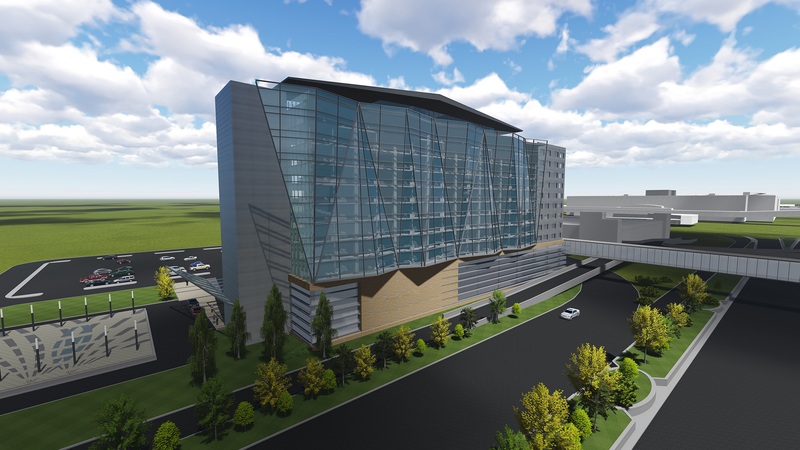 The new hotel will be skyway connected to the airport with its own security checkpoint. While details are still being negotiated, the company will likely be responsible for managing and financing that checkpoint. Intercontinental Real Estate Corp., not affiliated with Intercontinental Hotels, is Graves equity partner. PCL Construction and RSP Architects are also project partners. The spa will offer pools and relaxation rooms. Travelers who arrive early can use the spa before checking in and the spa rooms can be rented for partial days, "which is kind of unique," said Graves. "We started that at Graves (downtown Minneapolis) and it makes even more sense at the airport." Graves Hospitality hasn't finalized its brand because the situation grew competitive between various hotel flags once Graves was announced as the selected developer. "We have a couple brands lined up, but everyone came out of the woodwork," Graves said. "So, we are still working to find the No. 1 fit and the best deal." As for fit, Graves wants the brand that offers them the most flexibility to design the space as they want. "We want the one that lets us make this very Minnesotan. We definitely want to have our influence on it, we don't want to be vanilla where you don't know where you are," he said. The exterior will use local stone and materials, such as Kasota stone. It will also use glass and metal on the facade. Inside, Graves hopes to use local artists and elements that speak distinctly to Minnesota as a place. "I truly feel the site offers the best of both worlds," Graves said. "we really feel we are going to be the interface between the airport and the community. We are going to offer a restaurant where you can pull up, valet your car and come dine with us. The way that you approach the hotel will be pretty convenient and you don't have to go through airport security" if you are a member of the general public. Graves now has exclusive rights to negotiate with MAC. It will enter into at least a 40 year land lease. The company hopes to have the hotel up and running by the time Minneapolis hosts the Super Bowl in 2018.